After Years in Guantanamo Prison Without Charge, Future Even More Uncertain for Yemeni Detainees | Democracy Now! journalist and author the book The Guantánamo Files: The Stories of the 774 Detainees in America’s Illegal Prison. He is co-director of the film Outside the Law: Stories from Guantánamo. JUAN GONZALEZ: Next week will mark the eighth anniversary of the first transfer of prisoners to in Guantanamo Bay, Cuba. Although President Obama came into office last year promising to close down the infamous detention center, nearly 200 men are still imprisoned in Guantanamo. As the Obama administration grapples with security concerns stemming from the attempted airline bombing on Christmas, the future of these men hangs in the balance. On Tuesday, President Obama noted that the would-be bomber had received training in Yemen and emphasized his links to a Yemeni branch of al-Qaeda. He went on to announce that he had suspended the transfer of any more Guantanamo detainees to Yemen. 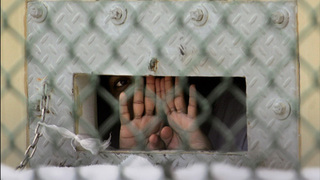 About half of the men remaining in Guantanamo are from Yemen. PRESIDENT BARACK OBAMA: Given the unsettled situation, I’ve spoken to the Attorney General, and we’ve agreed that we will not be transferring additional detainees back to Yemen at this time. But make no mistake, we will close Guantanamo prison, which has damaged our national security interests and become a tremendous recruiting tool for al-Qaeda. In fact, that was an explicit rationale for the formation of al-Qaeda in the Arabian Peninsula. And as I’ve always said, we will do so — we will close the prison in a manner that keeps the American people safe and secure. AMY GOODMAN: Meanwhile, classified Pentagon assessments show an increase in the number of prisoners released from Guantanamo who have joined militant groups like al-Qaeda. For more on the future of Guantanamo and the men still being held there, we’re joined now from London by journalist and author Andy Worthington. His book is called The Guantánamo Files: The Stories of the 774 Detainees in America’s Illegal Prison. He is co-director of the film Outside the Law: Stories from Guantánamo. We welcome you to Democracy Now! Explain what you understand will happen to these Yemeni prisoners, Andy. Well, I’m not sure what’s going to happen to them. I mean, the President didn’t put a time limit on how long he’s going to wait before all this dies down and before he can get some more of these men transferred back to Yemen, because without it, clearly, it’s going to be next to impossible to close the prison. And I think that’s really the worrying thing about how this deadline has slipped. You know, last year, in the executive order, the President announced that the prison would close by January the 22nd. He conceded two months ago that that deadline was going to be missed, but he hasn’t set a new one. How long is it going to take? Will these things just roll on forever? I think it’s very hard to tell at the moment, and that’s really quite disappointing. JUAN GONZALEZ: Well, Andy Worthington, many conservative leaders have been criticizing the administration, especially for the most recent release of six of the prisoners, but there was not a whole lot of furor over the approximately 500 or more released under the Bush administration. Could you talk about that? ANDY WORTHINGTON: Well, absolutely. I mean, I think one of the — I think — I was absolutely shocked by the hysteria that greeted this failed bomb plot. I mean, I don’t take a bomb plot lightly, but the hysteria that greeted it was so misplaced. You know, first of all, ABC News came out with a poorly researched story suggesting that the failed bomber had met with a group in Yemen which involved two prisoners, Saudi prisoners, released from Guantanamo. It turned out that one of these men had actually handed himself into the Yemeni authorities in February last year, several months before Abdulmutallab arrived in the country, so he clearly couldn’t have been involved. We’re left with this one, sadly. Now, what’s been mentioned but really hasn’t been made much of, and particularly hasn’t been made by lawmakers and other right-wing pundits who have seized on this, is that these Saudis — this Saudi, and there are allegedly a few others — were released by George W. Bush. They were released after military review boards at Guantanamo. And they were released after the intelligence services had actually suggested that these men shouldn’t be released, because they felt that they constituted a danger. So it’s part of a diplomatic deal that was done between the Bush administration and the Saudis. But it’s nothing to do with the Yemeni prisoners in Guantanamo. It’s nothing to do with Barack Obama, who’s been very careful about who he’s been releasing. You know, so I find that absolutely disgraceful, really. And we’ve ended up in this position where Yemeni prisoners who have been held, for the most part, for eight years, who have been approved for transfer by the deliberations of the interagency task force established by President Obama this year, in some cases by the US courts after having their habeas corpus petitions granted, and now being made the victim of this game of political football. And I’m disappointed that President Obama backed down. It’s yet again another example of pragmatism which really, I think, comes out as cowardice, because John Brennan, when he went on the TV shows at the weekend, made a very strong and credible and coherent case for what the administration was doing, why it was — how it was working with the Yemeni government regarding these transfers, how it was doing everything very carefully and wasn’t making the same kind of mistakes that were made by the Bush administration. ANDY WORTHINGTON: So I think it’s just another example of backing down under pressure. Sorry, Amy, go ahead. AMY GOODMAN: Andy Worthington, I wanted to ask you about this piece in the New York Times yesterday that says, “Administration officials said…that a classified Pentagon report concludes that [of] some 560 detainees transferred abroad from the military prison at Guantanamo Bay, about one in five [has] engaged in, or is suspected of engaging in, terrorism or militant activity. ANDY WORTHINGTON: Well, you know, this is really quite extraordinary, I think. I mean, we have a story which is put out by a number of supposedly reputable media outlets, based on a statement by a Pentagon spokesman. Not a single shred of paper was presented to any of these media outlets indicating any names, any information whatsoever. And just -— you know, just back in May last year, we had another version of this story when a Pentagon report that actually included some names said that one in seven of the people released from Guantanamo had returned to the battlefield. The New York Times got in trouble. They ran a front-page story spouting this information about the seventy-four and failing to point out that the Pentagon had actually only named twenty-seven people. Now, when researchers who have done a lot of work on this, from the New America Foundation and from the Seton Hall Law School, their figures of the number of people who could be said possibly to have either returned to the battlefield or to have engaged in some terrorist activities, in the first place, was somewhere between a dozen and twenty, so nowhere near the seventy-four. So what we get the other day that everybody leaps on in the media is a claim that now this figure is over a hundred. And yet, if we compare it with what could be factually established back in May, that would mean that we’ve got, what, eighty or ninety people who have rejoined the battle just in the last six months. It’s absolutely ludicrous. You know, and the Pentagon consistently produces these kind of — this kind of information at useful times. I mean, it really makes me wonder who’s running the show here. Who in the Pentagon is making this kind of material available the day after Barack Obama has backed down on releasing any more Yemenis, which is clearly part of a whole story that makes it more and more difficult to close Guantanamo? Whose side are they on? Whose agenda is being set here? JUAN GONZALEZ: Andy Worthington, you’ve delved into a lot of the individual stories of the prisoners at Guantanamo. Tell us about some of the Yemenis that are still being held and whose now — whose continued incarceration or freedom hangs in the balance now on the decision of the Obama administration. ANDY WORTHINGTON: Yeah, sure. Well, I mean, you know, by my reckoning, there are eighty-six Yemenis still in Guantanamo. About twenty-two were seized in Afghanistan; about thirty-five somewhere at the Pakistani border, perhaps crossing from Afghanistan, perhaps they had actually been in Pakistan; and twenty-five were captured in house raids in various cities in Pakistan, far from Afghanistan. Now, you know, some of these men had traveled to Afghanistan for reasons of humanitarian aid or because they were missionaries. I mean, certainly not all, by any means. You know, a lot of people had traveled there to help the Taliban fight against the Northern Alliance in an inter-Muslim civil war that had been going on long before the 9/11 attacks and essentially had nothing to do with al-Qaeda. But you also have quite a lot of these people who were seized in these house raids in Pakistan. Some had gone looking for cheap medical treatments. A number of these men were very clearly students. And some of the prisoners who have been cleared were caught in a guest house in Pakistan. And several of these have been released. One of them won his habeas corpus petition last May. And Judge Kessler, when she made the ruling in his case, the case of this man Alla Ali Bin Ali Ahmed, she said that there were a number of other people in this house and that, from what she could tell, their stories were almost certainly the same. And this man was a student. The judge said that the government had relied on unreliable witnesses within Guantanamo who had made false allegations, that it had attempted to construct a mosaic of intelligence that didn’t stand up to scrutiny. So she threw out the case and ordered this man to be set free. And there are clearly, you know, other people in this house that are still held in Guantanamo. They’ve been cleared for release, and yet it’s this game of political football that is preventing them from finally being freed after eight years. And I find that really completely unacceptable. AMY GOODMAN: Andy Worthington, we want to thank you very much for being with us. His book is called The Guantánamo Files: The Stories of the 774 Detainees in America’s Illegal Prison, and co-director of the film Outside the Law: Stories from Guantánamo. We will certainly continue to cover this case or these cases.